Published: July 14, 2015 at 11:04 a.m. Updated: June 23, 2016 at 07:51 p.m. 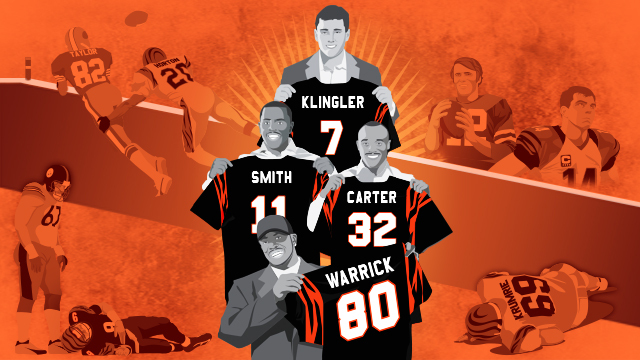 The Bengals are the NFL's Kings of What Might Have Been. With some better decisions, improved timing, maybe just a pinch of luck, they could be seen as one of the NFL's most successful organizations. Think about that. The Bengals. But each time the Bengals approached greatness, they made a wrong turn or were otherwise detoured away from a better place in history. Sports fans love to play the "What If?" game. What if the Patriots don't take Brady? What if the Yankees don't purchase Ruth? What if the Bulls missed out on Jordan? Bengals fans don't like playing this game. The "What If?" game isn't fun when you're always the grim flip side to a feel-good sports fairytale. What if Greg Cook didn't land on his shoulder? What if Bill Walsh stayed in town? What if Carson Palmer sidestepped Kimo von Oelhoffen? Only the Bengals could see their fortunes irrevocably upended by a human named Kimo von Oelhoffen. Stick around long enough, and most of us get to experience both sides of the fan spectrum. These things are supposed to be cyclical. Taking some fan lumps isn't a bad thing! After all, to truly appreciate the good times you have to experience life in the gutter. The Bengals are the caterpillar that never turns into the butterfly. The awkward kid with braces who grew into the gawky grown-up with slightly better teeth. For that reason, they come in at No. 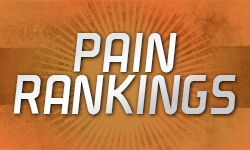 6 on the Pain Rankings. Greg Cook was The Chosen One. He led the AFL in multiple passing categories as a rookie, helping to turn Cincinnati from hapless expansion team to a franchise that deserved respect. And then he was gone. Early in his rookie season, Cook hurt his shoulder on a sack. He played through the injury and continued to perform at a high level, but the shoulder began to deteriorate and medical science at the time wasn't advanced enough to provide a fix. A torn rotator cuff -- the same injury that served as a momentary speed bump in Drew Brees' career -- had essentially ended Cook's. "If he had stayed healthy," owner Mike Brown once lamented, "we would have been the team of the '70s, not the Steelers." Said Bill Walsh: "Greg Cook was, I believe, the greatest talent to play the position. He was Steve Young, but bigger." In his excellent longform piece on the birth of the Ohio River Offense, Chris Wesseling called Cook "the kind of transcendent talent every offensive mastermind hopes to find once in a lifetime." The Bengals held the winning lotto ticket, then watched a gust of wind steal it from their fingers. Everyone knows the Joe Montana story from Super Bowl XXIII. With the 49ers trailing late in the fourth quarter, Montana huddles with his teammates deep in their own end of the field and casually notes actor John Candy is watching from the stands. This random celebrity spotting -- as history has it -- acted as a tension release in the huddle and set the tone for the title-sealing touchdown drive that would follow. The Uncle Buck Effect, as it were. This is perhaps the essential Montana anecdote and it basically cemented his "Joe Cool" reputation. But let's look at it from a non-Candy perspective. The Cincinnati Bengals were one defensive stop away from knocking off the mighty 49ers to win the Super Bowl. But they couldn't do it. The Niners marched 92 yards over the next 11 plays, culminating with Montana's 10-yard touchdown strike to John Taylor. The play remains a dagger in the heart of all Bengals fans. Walsh leaves town: Before Bill Walsh became the coaching legend he's recognized as today, he was a young assistant working under Paul Brown in Cincinnati. Walsh and Brown revolutionized NFL offense with their ball-control passing scheme, popularly (though not accurately) known as the West Coast Offense. But when Brown decided to leave the sidelines for the owner's box, he passed over Walsh to hire Bill "Tiger" Johnson. Walsh was crushed by the decision and felt betrayed by Brown, who he believed had worked behind the scenes to keep him from getting other jobs. Walsh got the best revenge, eventually landing in San Francisco, where he won three Super Bowls with Montana. And who did Walsh's Niners beat in two of those title games? The Bengals, of course. Palmer's tough break: Carson Palmer emerged as a star in 2005, throwing for nearly 4,000 yards with 32 touchdowns, just 12 interceptions and an NFL-best 67.8 completion percentage in leading the Bengals to an 11-5 record and the AFC North title. But on the first pass of his first playoff game, Palmer tore two knee ligaments when he was hit low by Steelers nose tackle Kimo von Oelhoffen. The Bengals couldn't recover from the loss of their best player, while the Steelers went on to win their fifth Super Bowl. "They had every right to be upset. They lost their best player," von Oelhoffen said after the game. "I hope Carson gets better. My apologies to him and his family. I was worried about Carson. That kid deserved to play this game." Draft follies: Ki-Jana Carter. David Klingler. Dan Wilkinson. Peter Warrick. As the franchise dipped deeper into their '90s Bungles abyss, it was continued whiffs on high first-round picks that became a calling card for the team. But no miss was as egregious as the selection of Akili Smith with the No. 3 overall pick in the 1999 draft. Owner Mike Brown fell in love with Smith's upside based off 23 games at Oregon. When the Saints offered nine draft picks over the '99 and 2000 draft to move up in the first round to hopefully select Ricky Williams, the Bengals said no. "It was a generous offer, but we felt now is the time to get the quarterback," Brown said on draft day. "We've been saying that all along." Smith was a disaster from the start, engaging in a lengthy contract holdout as a rookie and looking lost when he made it on the field. He ended up lasting four seasons in Cincinnati, throwing just five touchdown passes. Super Bowl XVI miscues: Playing in the first Super Bowl in their history, the Bengals outgained the 49ers but committed four turnovers and were turned away at the goal line on one drive in a 26-21 loss. "You have the opportunity to play the biggest game of your life and you don't play as well as you can play," said former Bengals offensive lineman Dave Lapham. "It haunts you forever." Wilson slips up: Stanley Wilson was a talented fullback who played a key role in the '88 Bengals' dominant running game. But on the eve of Super Bowl XXIII, Wilson relapsed into cocaine use and was suspended by the team. It was a stunning turn of events that forced the Bengals to abandon much of their offensive game plan. The relapse was strike three for Wilson, who was banned by the NFL and never played another snap. "Didn't mean enough to him to make the right choice," Krumrie would later say. Krumrie goes down: Tim Krumrie was recognized as the heart and soul of the 1988 Bengals. The gritty nose tackle was an All-Pro that season, his play serving as a main reason for Cincinnati returning to the Super Bowl. But Krumrie suffered one of the more memorable and gruesome injuries early in Super Bowl XXIII when he broke his leg in the first quarter. Don't Google it. Despite needing surgery to repair the break, Krumrie remained in the locker room for most of the game until he was told his body could go into shock if he didn't get to a hospital. Would the Bengals have stopped the Niners on that final drive if Krumrie was on the field? We'll never know. Billups can't hold on: The last in the holy trinity of Super Bowl XXIII regrets. Leading the 49ers 13-6 early in the fourth quarter and with San Francisco deep in Bengals territory, cornerback Lewis Billups steps in front of Montana pass for what looked like a sure interception. The ball clanged off his hands and fell to the turf. Montana found Jerry Rice for the game-tying score on the very next play. Solomon Wilcots is an analyst for NFL Network who played six seasons in the NFL, including three as a defensive back with the Bengals from 1987 to 1990. After retiring, he covered the team in the '90s and early 2000s, a period he calls "The Age Of Unenlightenment." You played in Super Bowl XXIII, a game with so many "What If" moments. How long did it take to get over that loss? A long time. I still think about it. We were wholly confident going into the game. Look at all the Super Bowls the 49ers have played in with the great players. Look at the scores of those Super Bowls -- against Miami, Denver, San Diego. They blew those teams out. The two games they played against us they won by the skin of their teeth. We knew we could beat 'em. This is not hyperbole at all. We weren't coming in saying, "Oooooh, the 49ers!" We were like, "Bring it!" The night before, our fullback (Stanley Wilson) runs off in the middle of the night, and we're like, "Damn, there goes about 20 percent of our game plan." Then Tim Krumrie goes down. He's our best player on defense. The heart and soul, really, of our team, to be honest with you. We knew how to stop them. Sam Wyche had coached with Bill Walsh. Our coach was his protege. Our guy and their coach was our owner's protege. It was incestuous! We knew all their plays, they knew all our plays. Nobody was going to have a breakout game. Two seasons later, you left the Bengals. Why? I remember many of my teammates calling me and asking me, "Dude, what are you going to do?" I said, "Man, I gotta go." And they were like, "Why would you leave?" I was like, "This team is getting ready to be horrible! Guys, look at all the great players we had. Look how many are left." The Bengals have made the playoffs the past four years, but still haven't won a playoff game since January 1991. Can the team take the next step with Marvin Lewis and Andy Dalton? You gotta remember where you came from. It's like if you were born over in Watts and then you become a CEO and someone says, "Well, you're not chairman of the board." Come on! Marvin Lewis raised the Titanic. This team was at the bottom of the ocean when he came in. They are a perennial playoff team. Go back and check how many teams have been in the playoffs in each of the last four years. (Note: The Bengals are one of four teams.) You have a team that couldn't even spell playoffs, and now they're getting there and everybody has this lack of patience. Remember, Marvin Lewis raised the Titanic. And where they're at right now is a sweet spot, even if no one's satisfied yet.